Very Funny Murder Mystery Party at any location you choose! From corporate parties and fundraiser events to public dinners and birthday celebrations we have helped thousands of audience members in Phoenix bring tears to the eyes of their laughing friends, family and co-workers. 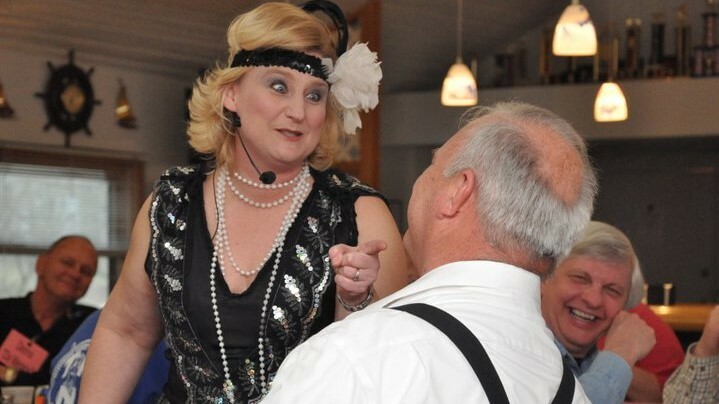 With our entertaining characters, interactive shows, energetic performances and the best murder mystery actors from Phoenix and across the nation, we treat your guests to a night of hilarity with our murder mystery party entertainment. We truly have the best Murder Mystery Party in Phoenix, AZ! Our murder mystery parties in Phoenix are interactive comedies usually built around a meal, but they don’t have to be. Plus, all of your audience members will play parts. They can choose a big part, a little part… or just watch. It is up to them! We have an easy 3 step process. Request a free, no obligation quote. Book us before your date fills up. Need a little help planning your murder mystery in Phoenix? Here are the basics. You will need to arrange for a banquet space, the location and menu of your choosing, perhaps in Phoenix. Then ask us, Jest Murder Mystery Company, to come in as your turnkey entertainment. Sweet, simple and very, very funny. It’ll be an evening your audience will never forget. Just wanted to let you know that everyone was absolutely delighted with Bullets in the Bathtub! There were a fair number of folks who had costumes which added so much to the experience, and John and Ali were terrific!! Planning a corporate event or company party in Phoenix, AZ and need entertainment? Our message is simple. We provide a great and funny murder mystery parties in Phoenix for your company event, ones you’ll be proud of, with lots and lots of participation that your audience members will talk about for years! I would like to thank you, David and Ian. The group had a wonderful time!! Laughing so hard, they had tears running down their faces. Ian and David were fabulous. We will be calling again. We put the “FUN” in “FUNdraisers”! No kidding. Once your group chooses us, it raises the bar for party entertainment and ticket sales because your audience will be asking to buy tickets again for the next year and the next… and the next…. So next time you are booking entertainment for your fundraiser be sure to get your free quote for a murder mystery party in Phoenix. I was very pleased with the show! The actors did a great job with getting everyone involved! Want to host a Private Party, Birthday Party, Wedding Rehearsal Dinner, Friends Night Out, etc? One that you, your family and your friends will talk about for years? Hire Jest Murder Mystery Company to provide a murder mystery for your guests in Phoenix. So many times we here the comment “My friends are still calling me by my character name!”. Don’t you want your name changed too? It was a wonderful experience working with Jest Murder Mystery Company. The kick off event of “Bullets in the Bathtub” murder mystery for our family reunion was a tremendous success and set the tone for the rest of our weekend! It truly was the highlight and created such humorous memories that the laughter continued throughout our weekend. Once again, thank you, for helping us create such happy and “killer” memories! Looking for something new to bring people to your restaurant or banquet space in the Phoenix, AZ area? Make additional revenue with our tried and true comedic murder mystery shows. Ask about our options for restaurants and banquet facilities in Phoenix. Our murder mystery shows are just the thing to bring new customers thru your door Phoenix. We are huge fans of Jest Murder Mystery Co. This was our first experience with a murder mystery dinner and it was a huge success. The dinner drew a different crowd than we have had for other events and we were delighted to fill the room with so many first time Ruth’s Chris diners. We had several guests ask us when we would be doing another show. The wonderful people at Jest were very easy to work with when planning our event. The actors were a pleasure to work with the night of the event. They were so much fun both in and out of character and worked very hard to ensure that our guests had a wonderful time. We look forward to hosting another event with Jest!